In a Secured loan, the borrower provides some form of security to the lender eg a home or car. If you cannot repay the loan, you may lose your home or car. Secured loans usually give you the option of higher borrowing limits and lower interest rates and are generally easier to obtain. The amount you can borrow will be partly determined by the value of the asset you are borrowing against. Secured loans are sometimes called Homeowner loans. Unsecured loans do not require any form of collateral so you will not lose your house or car if you cannot keep up with payments. The lender will make a decision to give you a loan based on your income and your credit history. Unsecured loans typically carry a higher interest rate than secured loans. If you don’t pay, they can take you to court! Note also some people have more options and choices that others when it comes to credit. However, many people take the first offer they get, they don’t want to make a fuss as they don’t want to look like they can’t afford it. However others are smarter with their money, they’re not going to pay more than they have to for anything! 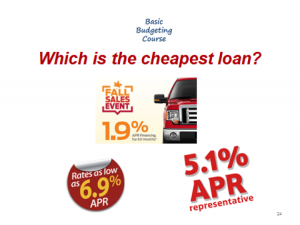 With an APR, the LOWER the number, the less you pay, but many people think a BIG number is good. Note the 6.9% advertisement – the words “as low as 6.9%” may be a trap. They may only offer those rates to certain people, depending on their circumstances or their credit score. You may be offered a much higher rate! The APR is 1.9% for 60 months which sounds a good deal, but what is it after that? Can you afford it?? If you can’t you could lose your car and all the money that you’ve already paid! Question: Search a newspaper or Google for some debt offers. Read the fine print!